My husband says that this is my happy face since I love shopping. I’m really just happy about this cozy new coat (true to size) and this soft blanket scarf. This faux fur parka is also available in grey. However, black is always chic and I’m all bundled up, wearing a comfortable sweater, stylish booties and ready to shop until I drop this long weekend. Have you checked out Ann Taylor’s holiday shop this year? There are a lot of pretty gift ideas but I was surprised to see that shoes did not make the official gifting list. I love the little bows on these heels which make your feet look dainty. These block heel booties are comfortable off the bat and classic black means that they will become a closet staple. 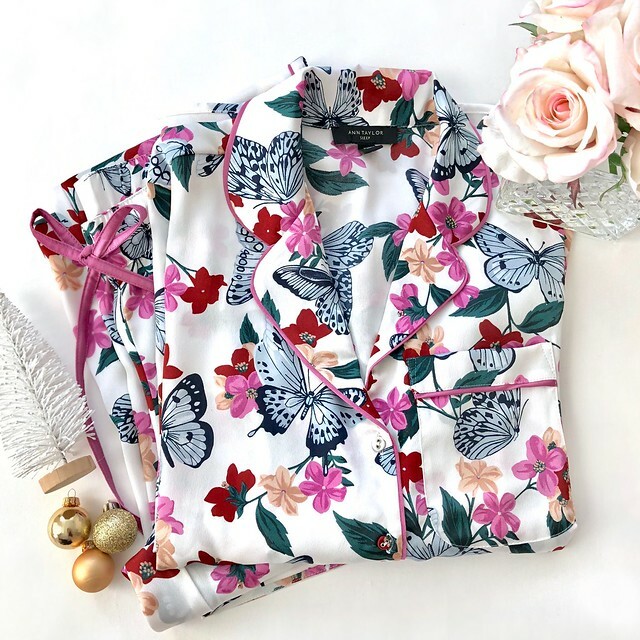 I recommend getting this beautiful pajama set (fits true to size) as a gift to yourself. They would also make a delightful present for your mom, sister or best girlfriends. Jess, what are your thoughts on this vs. J.Crew's chateau parka? Which is warmer? I love how full the fur looks! Thanks! Hi Leilani, Let me wear it out today and report back! This one fits closer to my body and has a quilted lining so I don't feel the air going up my body. @Leilani, Today was 45 degrees out which isn't that cold to me (compared to below 20 and negative windchill when I took the above photos) and this coat was perfect! Inside the mall the jacket made me really hot and I wanted to take it off. I purposely wore a thin sweater today to test the warmth of the jacket and it's toasty. To me this jacket seems warmer than the J.Crew one which is also a looser fit (I took 00 in the J.Crew jacket) but the fit is good for layering to stay warm.